So Japanese week is nearly over. Sad times. Today’s offering isn’t truly ‘authentic’ Japanese Sushi, it’s more of a Western thing – hence California in the name. Uramaki is Maki that is rolled inside out. The rice goes down first, then the nori, then the filling leaving the rice on the outside. The California bit refers to the filling of avocado and fish sticks seen in the many Sushi Lunch Deals supermarkets offer. [There are loads of other Western-Themed Maki which may crop up later this year.] The Uramaki is then rolled in toasted sesame seeds. Most sushi consists of the same basic ingredients so this week has been easy as I already had plenty of sushi rice and the only real variation is in the filling. The rolling of the sushi was really what I wanted to test out this week so here goes. I’m also going to knock up a Bento Box with leftovers for my lunch too. 1. 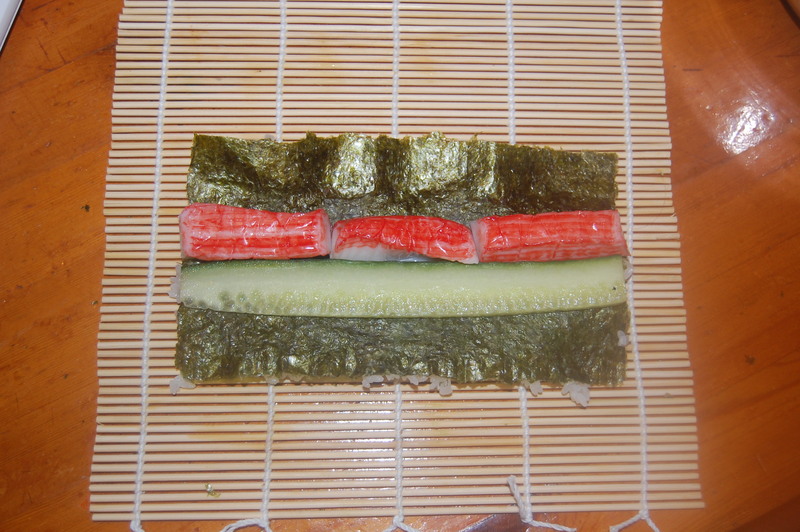 The start to making an Uramaki is exactly the same as if making a traditional Maki. 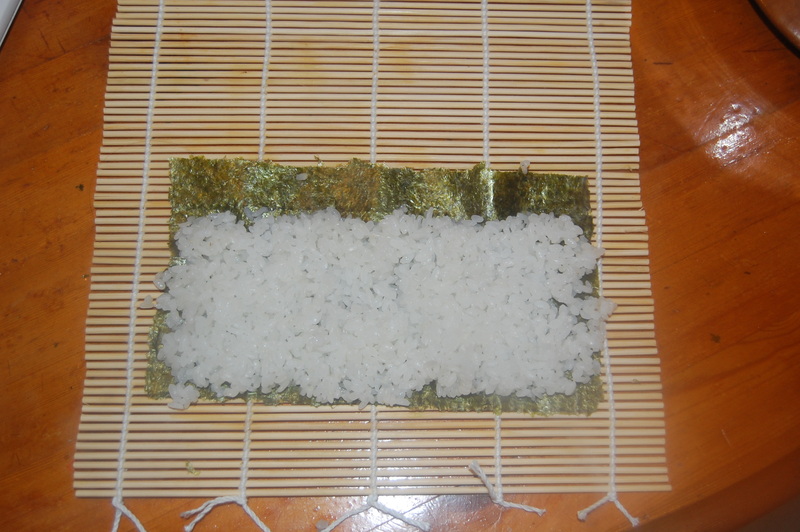 Place the nori shiny side down and apply a layer of rice, gently spreading over the nori. This time though, leave a much larger gap at the edge. 2. 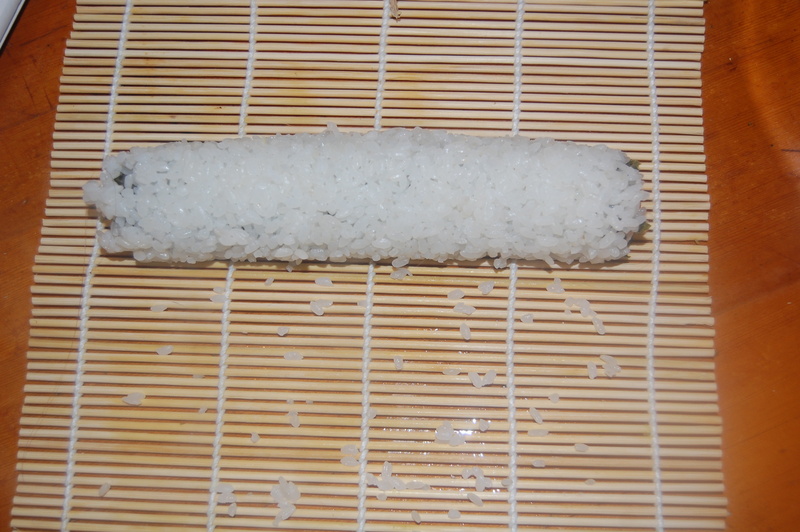 Carefully flip the nori/rice over so the shiny side of the nori is facing up and the rice is touching the bamboo mat. About 2-3cm from the bottom edge of the nori, lay the filling. 3. Using the same method as with the traditional Maki, hold the filling in place and flip the bottom edge of the nori over the filling. Gently roll the bamboo mat upwards, tucking the clear nori in as you go. 4. With a wet knife, slice the Uramaki into 6-8 pieces and serve. 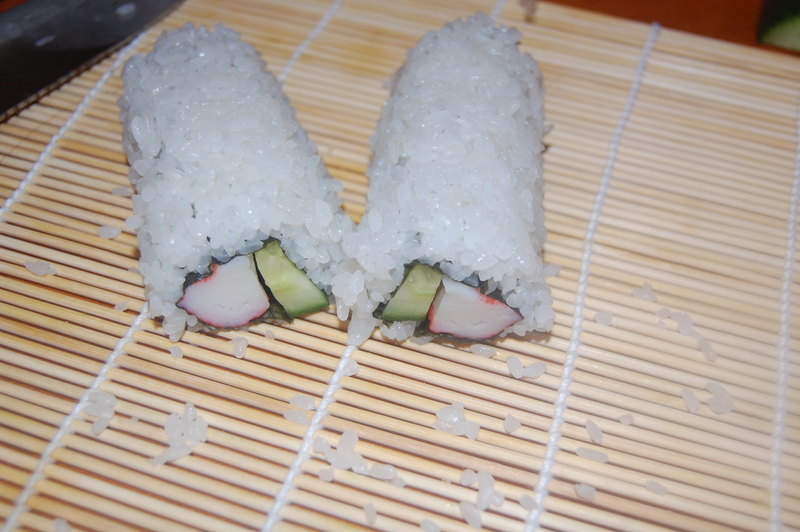 This was much much harder than the Maki, though both were easier than the first time I tried a while ago and I will be making sushi a lot more often as it seems quite healthy too – depending on filling. I hope to try and experiment with varying the rice as there must be a wholegrain version out there somewhere. You may notice the rice everywhere over the bamboo mat. That stuff got everywhere. Some videos recommend plastic wrapping the mat but it brushed of easily enough when washing. I did have to swap avocado for cucumber too as the stores only had the ‘wait 8 days to ripen’ ones in stock. Shame. I would love some ideas for fillings too, as well as any ideas of a rice substitute I could use if there is one out there.